Genius Maxfire Grandias Turbo USB Gamepad, High precision 8-Way D-pad & 8 action buttons include triggers, USB Plug & Play Copyright © 2019 ComXpert International CC - COPYING IS ONLY ALLOWED FOR THE PURPOSE OF SENDING US ENQUIRIES. E&OE. 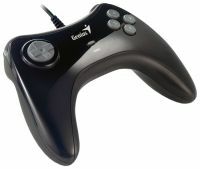 MaxFire Grandias is the latest game pad fromGenius specifically designed for PC gamers. It features the Turbo function for auto repeat, which is great for action or shooting games. An eight-way D-pad fits perfectly in your fingers and it's much easier to use than the directional keys on your keyboard. With eight action buttons, it includes four side buttons for the best control in action games. Now, you can use both hands when you mimic your favorite heroes in PC games! Also, the ergonomic design makes the game pad comfortable to hold and is durable. The USB interface supports plug-and- play, no additional driver required and MaxFire Grandias is Windows Vista capable. Just grip MaxFire Grandias, plug in the USB interface to your PC, set your Turbo buttons, and you’re on your way to take on your favorite game! The best price and guaranteed service and backup from official computer suppliers in South Africa for the MUL427 Genius Maxfire Grandias Turbo USB Gamepad. The Genius MUL427 Genius Maxfire Grandias Turbo USB Gamepad is available for R98. The product is sold by ComX Computers as new. Prices are valid today 2019-04-22 (before 2019-04-23 , by quote, while stocks last). The product is expected to be in stock, although this is not guaranteed. Find related MUL427 Genius Maxfire Grandias Turbo USB Gamepad products in our Game hardware Category for even more options. Read reviews and find out about MUL427 Genius Maxfire Grandias Turbo USB Gamepad. Discounts, specials and cheap prices only at ComX Computers.